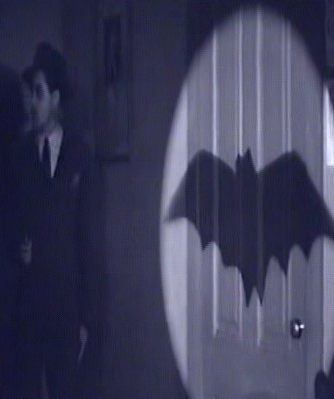 Usually I have no patience for the modern artiste who insists he's creating Great Art. Don't know if anybody remembers the Meehan Streak cartoon that the Taipei Times used to run, but it used to have a running gag with two critics in a gallery: one slavishly worshipful, the other blithely contemptuous. I'm not ashamed to say, that contemptuous guy is me. 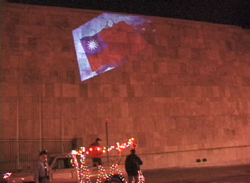 A US-based Taiwanese artist was questioned briefly by the FBI on Dec. 10 after he projected giant images of [the flag of Taiwan's main independence party] and a Republic of China (ROC) flag on the side of China's New York consulate and the UN's headquarters. Momma Bear to Poppa Bear, Momma Bear to Poppa Bear, we have a code 5-18 violation. Repeat: we have a code 5-18 violation. Yeah, that's right. 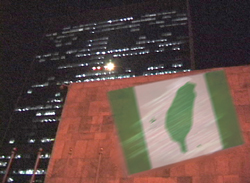 Illegal display of Taiwanese regalia on UN premises. I know, when will they ever learn? What's that, come again? The Chinese ambassador is advising we not take any chances? If we see the perp, shoot to kill? But we're not supposed to hit any "valuable transplantable organs"? Yeah, I'm sure Yang Chin-chih changed a LOT of hearts in Beijing <eyeroll>. But bravo, anyways. And Happy New Year, Communist China.